This article is part of a special Black August series on TheBurningSpear.com. 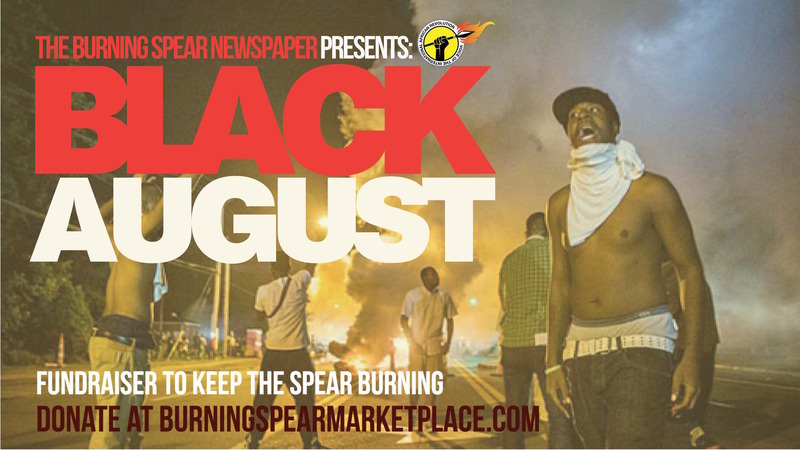 We encourage all our readers to help Keep The Spear Burning during our Black August Fund Drive. Support news in the hands of the African community! Donate today at burningspearmarketplace.com! FERGUSON, MO—August 9, 2017 marks 3 years since the police murder of 18-year-old Michael Brown Jr. Young Michael was murdered by Ferguson, MO copy, Darren Wilson. Witnesses stated that Mike Brown was shot eight times while his hands were in the air. His rotting body was then left on the concrete for more than eight hours as an example to the Ferguson community of what the police will do if we disobey their colonial orders. What the police did not expect in this suburb of St. Louis, MO was resistance from the African working class community. This powerful display of African Resistance on August 9, 2014 marks one of the critical dates in Black August. The African community, enraged by the blatant murder of Mike Brown, began chants of “Kill the police!” and embarked upon a protracted struggle that saw Missouri’s government show the nature of the State by unleashing military weaponry against the fighting African community. Mike Brown’s murder was not unfamiliar to the African community, but in the age of social media, the rebellion in this small community could not be kept isolated. News of this incredible resistance captured the hearts and minds of Africans throughout the U.S. and elsewhere. The resistance in Ferguson helped to amplify the insistent outcry of the black community in police killings like those of Eric Garner in New York City, 12-year-old Tamir Rice in Cleveland, OH and Freddie Gray in Baltimore, MD. The Uhuru Movement on the Move in Ferguson! As reports surfaced of the firestorm of resistance in Ferguson, the Uhuru Movement knew we needed to intervene in this struggle and bring leadership to this community. Our Chairman, Omali Yeshitela, and other organizers of the Uhuru Movement organized meetings, led protests in the community and were able to later recruit our future President of the International People’s Democratic Movement (InPDUM) into the organization, Kalambayi Andenet. Through our consistency and work in organizing in this community, Ferguson, MO is now the headquarters of InPDUM. Our Movement also understood that the African petty bourgeoisie would attempt to stifle this resistance with opportunistic action and reformist solutions. They presented short-sighted reforms as ultimate solutions. These include police body cameras, civilian review boards and more black cops like Missouri Highway Patrol Captain Ronald S. Johnson who was asked to take over “law enforcement duties” in the wake of the rebellion. The working class spontaneously chanted “kill the police” but were seduced into the passive “hands up, don’t shoot” and “black lives matter,” a call that assumes the solution is to get white people to like us enough to stop killing us. The Uhuru Movement has over 40 years of struggle and understood the significance and the possibilities in Ferguson because we have led these struggles in the past. This year also marks the 20-year anniversary of the Battle of St. Petersburg where, like Mike Brown, 18-year-old TyRon Lewis was killed by the local St. Petersburg police just blocks from the Uhuru House, headquarters of the Uhuru Movement. Like in Ferguson, the murder sparked a rebellion from the African working class. What separated Ferguson from the Battle of St. Petersburg, however, is the constant revolutionary leadership of the African working class in the St. Petersburg community for decades. The Battle of St. Petersburg is not as well-known because we weren’t in the age of social media, and the bourgeoisie did not want the resistance in St. Pete to become an example to other African communities. The African working class engaged in every level of struggle from armed resistance to electoral politics, and the African working class looked to the Uhuru Movement for leadership in this struggle. It would be eight years over a decade before another African was killed by the police in St. Petersburg, FL. The resistance and constant protests in Ferguson forced the district attorney, Bob McCulloch, to empanel a grand jury to act as if the State was considering prosecuting Darren Wilson for murdering Mike Brown. After months of deliberations, however, the grand jury did not indict Wilson. After the press conference and the release of grand jury transcripts there was little doubt why Wilson was not indicted: district attorney McCulloch had no interest in getting an indictment for Wilson. The stated purpose of a grand jury is to determine whether there is probable cause that a crime has been committed. It is generally a very informal process in which the prosecutor is able to choose which evidence they would like to show to the grand jury. They can even present evidence that they know could not be later used in a trial. After the non-indictment, the Uhuru Movement understood that we needed to empanel our own black grand jury. Our grand jury would give the black community confidence that we can deliver a more democratic process than the State. Our grand jury also served to show our people what our own State power would look like once we win the power to enforce any decisions we make in our black people’s courts. Chairman Omali Yeshitela served as lead prosecutor. We empaneled a grand jury of black residents of the Ferguson area. There were two days of testimony from community members of their treatment from police, from the parents of VonDerrit Myers who was shot in his back several times by St. Louis police days after Mike Brown’s murder, to the mother of Cary Ball who was killed by police in this area as well. We heard testimony from Mike Brown’s uncle who testified about the terror the family has faced since the day of his murder. The black people's grand jury indicted Darren Wilson of first degree murder. Struggle for Black Community Control of Police! We understand that the State is a coercive force, and that the bourgeois State was born to oppress colonized nations to extract their resources. The police are the first line of defense of the State. This is why the police do not function in the white community as they do in African and Indigenous communities in the U.S.
Police killings are the most expressive form of State power, but one of its most pervasive functions is the mass incarceration of the African community where over a million African people rot in prisons and jails around the country, making up nearly 50 percent of the prison population despite being only 13 percent is U.S. population. In the aftermath of Mike Brown’s killing, it was found that the police departments in Ferguson and several other jurisdictions in the St. Louis area were running debtor prisons where Africans were rounded up for nonpayment of fines and court cost and kept in jail until they could afford to pay. It was U.S. vice president Joe Biden who helped write the 1994 omnibus crime bill and former U.S. president William Clinton who signed it into law. We cannot limit our understanding of the contradiction with police to just shootings. There are those who have pushed that police should not have guns, that they must have body cameras and that they use tasers or rubber bullets to deescalate confrontations to reduce police killings. These suggestions miss the point that the community must have the power of this State apparatus. Eric Garner was killed by an admittedly illegal chokehold that was caught on video. Freddie Gray was killed after he was thrown into a police van, not placed in a seat belt and was given a “rough ride” throwing him around until his spine was severed. This rebellion put the myth to bed that we needed black politicians, black officers and civilian review boards as Baltimore has all three. Just recently on March 31, the Pinellas County Sheriff’s Office chased three black girls into a pond where they drowned. We must fight the police occupation that leads to these police murders. After the deaths of Alton Sterling and Philando Castila, the killing of five Dallas Police Officers and the wounding of seven by Micah Xavier Johnson has shifted the narrative of the discussion around police killings. Micah’s stance undoubtedly inspired Gavin Long to kill three Baton Rouge, LA police officer just days later. These revolutionary acts against the police have created bright lines in the black community where the African masses have resoundingly supported their stance. We must unequivocally stand for our people’s right to armed self-defense but must recognize that random acts alone against the police will not end the police murders in our community. We must continue to fight for black community control of police. The black community must have the ability to hire and fire the police, set the policy of the police and prosecute the police when they kill our people. It takes the power of this State apparatus out of the hands of their hands and in the hands of the people. Donate to our Black August Fundraiser! Support African Resistance and Self-Determination!